Welcome to Helix Media 360°! A brand new way to market multifamily properties. Showcase your community like never before with state-of-the-art technology and stunning imagery. What is a Helix Tour? A Helix Tour is a custom-designed, high-quality, 360° virtual tour of your community. Unlike most virtual tours, Helix Tours offer nearly unlimited customization and advanced features, which allows us to create unique online experiences based on your branding guidelines and marketing strategy. Our aerial 360° views are a captivating way to showcase your community from the sky. Aerial footage gives your tour a unique navigation feature and can showcase nearby landmarks, roads or selling features. 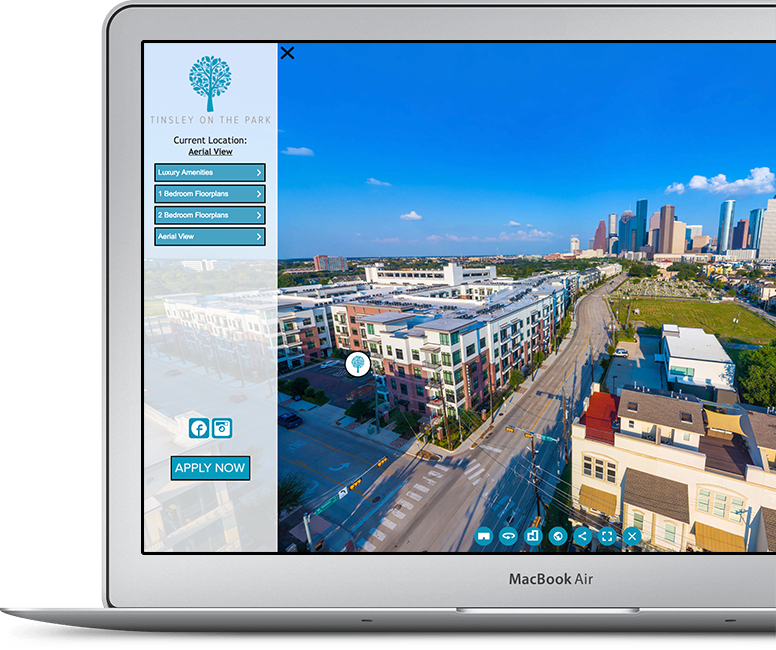 Our Neighborhood Views feature offers a collection of aerial and ground 360° views from your surrounding area, city or neighborhood. This allows you to expand your Helix Tour and give prospects a glimpse into the area in which they will live. Include a 3D rendered floor plan in your Helix Tour that allows prospects to drag and drop 3D furniture to visualize their space. Prospects can purchase furniture directly from the 3D model. Just like your community’s website, everything about Helix Tours can be modified to fit your preferences. From the color palette and branding, to the entire interface and navigation; Helix Tours set a new standard for creativity and customization. Helix Tours are filmed by in-house professional photographers using high-end proprietary equipment, which allows us to create consistently stunning imagery. Not every website is created the same. Helix Tours are designed to seamlessly integrate with every type of website including: WordPress, Yardi, Entrata, Engrain, Leaselabs, Real Page, and many others. Helix Tours retain users on your website longer, increasing session duration and time on site, which boosts your website’s SEO and drives organic traffic over time. With Helix Media’s built-in analytics tracking, we provide detailed insight into how users are engaging with your communities’ Helix Tours. We understand how to get the most value from a 360° tour and provide consulting services to help our clients maximize their returns. We train onsite staff, work with website vendors, and provide success audits through our analytics tracking. Our pricing structure is based around the needs of multifamily communities. Below you will find our three main packages for apartment communities. We offer A La Carte pricing so you have the flexibility to remove what you don’t want and add more of what you need. We offer regional & national bulk-order discounts starting at 3 communities all the way up to 50 communities. Contact us to find out how you can save on the number one virtual tour platform for apartments. Helix Media is dedicated to creating custom solutions based on our client’s individual needs. We take the time to fully understand your unique business goals and ensure your company’s brand and message are properly reflected in Helix Media’s content. Our number one goal with every project is to maximize ROI for our clients.